US regulators want to limit what you can do with your smartphone while you’re behind the wheel. Today, the National Highway Traffic Safety Administration (NHTSA) published its first safety guidelines regarding driver distraction, targeting portable and aftermarket devices (a.k.a. smartphones) or other gear you that you connect to your car. The guidelines, which are part of a Phase 2 for NHTSA proposals, follow guidelines outlined for infotainment systems (your car’s actual console), from 2013. Back in 2013, the NHTSA guidelines were about limiting the amount of interactions needed to complete an action—think touching a programmed favorite button rather than dialing a phone number. 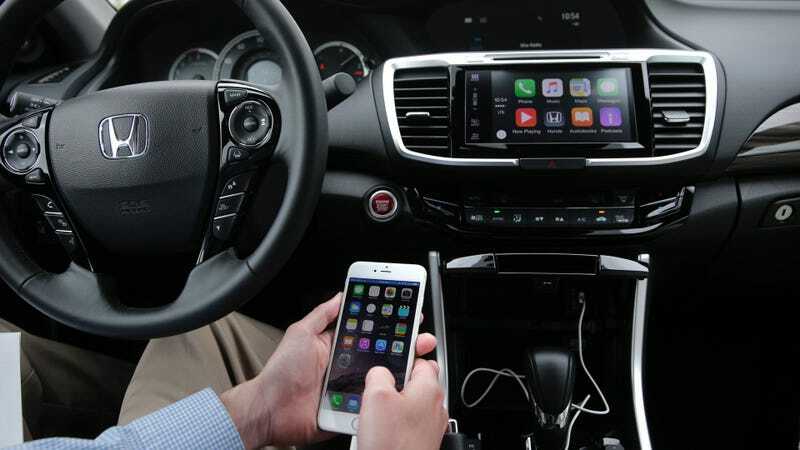 At the core of the guidelines is the concept of pairing a smartphone or other device with the car, and allowing a customized subset of apps and functions to run which are considered safer to interact with on the move. Dubbed “Driver Mode” by the NHTSA, it would build on efforts like CarPlay and Android Auto with a selection of tasks in a more straightforward interface. Drivers would be able to see maps delivered from their smartphone, short chunks of text that are believed to be readily consumed with a single eye-glance away from the road, and a greater reliance on voice control and input. But there is more. In addition to showing off maps and little snippets of text, the NHTSA’s system would also prevent certain features on your phone from working while paired to the car. For instance, you wouldn’t be able to playback video, display “certain graphical or photographic images,” scroll through long amounts of text, or do manual text entry. The NHTSA’s proposal says that its preferred method of enforcing Driver Mode would be through automatic activation. Your phone would automatically enter that mode after being connected to a car and once it’s clear that the car is in motion and going a certain speed. The problem for the NHTSA is that these are all just guidelines. Not only are these guidelines voluntary (meaning car makers could choose to forego implementing a special driver mode), but if the terms seem too onerous, users will just opt to not connect their phones to their car to begin with. Moreover, as SlashGear points out, there are already problems with systems like CarPlay and Android Auto working with third-party apps on phones. You can’t use Google Maps with CarPlay, which leads many users to just mount their phone and run the maps that way. We all know that distracted driving is bad. Like, crazy, scary bad. It’s actually safer to daydream while driving than it is to text while driving. So it’s important that the NHTSA address stuff like distracted driving, especially in the age of apps and smartphones. Still, it seems sort of nuts to suggest the outright banning manual text entry for phones connected to a car and expect users to ever voluntarily use those systems.